More and more couples today are choosing to keep their wedding guests safe when they celebrate their special day. Nothing mars a wedding celebration more than an accident or a DUI arrest. Many of today’s wedding couples will opt for an all-inclusive location for their wedding that includes both a reception hall and hotel rooms for guests to stay in after the party is over. The benefit of keeping the entire celebration under one roof is that nobody has to drive anywhere until the next day. Plus, when you host your wedding celebration at a hotel or resort, you can host a post-wedding brunch the next morning so the couple can spend on more meal with their friends and family before heading off onto their honeymoon. Another way some couples are focusing on wedding safety is by booking charter bus transportation for before and after the ceremony. The wedding party travels on the same bus to the church, perhaps to a remote location for pictures afterward, and finally to the reception hall. The benefits of leaving the driving to an experienced charter bus driver are obvious: The wedding party can celebrate throughout the day without having to get behind the wheel. Plus, it keeps all of the wedding party together so that nobody goes stray and delays the proceedings. The same charter bus can be used the next morning to transport guests back to their cars, or even to the airport if they traveled from out of town. Or it can be used to shuttle guests to and from the church to the reception hall. For today’s couples, the safety of their guests is an important part of their wedding day planning. 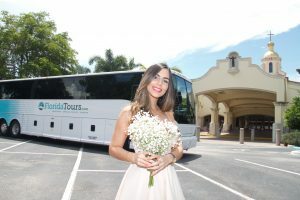 Keep your wedding guests safe and secure by including a charter bus from FloridaTours.com as part of your wedding day festivities.